An RC Tiger in GTA San Andreas. The RC Tiger is a small remote controlled vehicle that appears in Grand Theft Auto: San Andreas. The RC Tiger is a model tank evidently fashioned after the real-world Pz.Kpfw.VI Tiger (P) VK4501(P) (Porsche Typ 101), the rare Porsche version of the Sd.Kfz.181 Pz.Kpfw.VI Tiger I tank, used by the Germans during World War II. While seemingly using continuous tracks for propulsion, the RC Tiger actually uses a set of wheels hidden behind the static tracks; these features can be seen if it is accessed using a modification or driven on bumpy terrain. 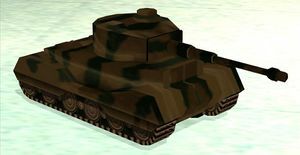 Because of its origins, the RC Tiger is the only vehicle in the game not to have a fictitious name. Its performance is actually similar to that of the RC Bandit, with a low speed but responsive controls. The RC Tiger does not appear outside "New Model Army" for Zero, where it is used by the player's opponent, Berkley, on a model battlefield. The vehicle can only be obtained and accessed through the use of modifications. The RC Tiger has a very unique engine noise that actually sounds like a tank. The RC Tiger is modeled after the dropped Porsche prototype of the Tiger I ("Pz.Kpfw.VI Tiger (P) VK4501(P) (Porsche Typ 101)") tank instead of the actual production model used in the war. Its track wheels resemble those of the Tiger II tank. Despite having a tank's cannon, it's not operable. However, during "New Model Army," Berkley's RC Tigers' cannon fired at Zero. This page was last modified on 6 August 2012, at 20:00.